ajmiam's Content - CC Zone: The Next Level - Chip's Challenge/Tile World website! My first CC2 levelset is here! A 40-level installment called "Chipit or Whiffit"! Check the download page here for more details: Feel free to leave any feedback in this thread, on the download page, or by pinging me (@ajm-i-am) in the Chip's Challenge Bit Busters Club Discord server. Also, note that all 40 of these levels are being submitted for CCLP consideration, and all 40 of them have notes under the Comments box in CC2's editor, so check those out if you're curious. Enjoy! This is the full release of my first Chip's Challenge 2 custom levelset. Are you smart enough, brave enough, persistent enough to persevere through all 40 of the challenges contained within? Or will you whiff it and bail out? Only one way to find out... There are 40 levels in this pack, as well as a .c2g file to make them playable as a set in Chip's Challenge 2. 33 of them are unique to this set, and the other 7 were submitted to various level design contests here on CCZone. (4 of those are remakes of CC1 contest levels that didn't have a CC1 set to call a home.) There are several casual levels, but due to the pack's small size the difficulty ramps up fairly quickly. I recommend you have moderately good knowledge of CC2 mechanics before attempting this set. (Playing the first half of CC2 should suffice.) Also, after you play each level, feel free to load it in the editor and open the Properties dialog box--I left comments describing their history! I hereby submit all 40 levels in this set to be considered for all CC2 community level packs. However, note that Level 23 (Sticky Controls) forbids boot dropping (and mentions this in the hint). It can't really be redesigned to avoid this easily. Depending on the rules of community level packs, this may disqualify it from consideration. I would like to give thanks to mobius and chipster1059 for playtesting parts of this set. Their feedback helped me adjust some frustrating sections to be a bit easier. I have also included a "rejects" set of levels that were either unfinished, prototypes of actual levels, or just deemed not good enough to make the final 40. Out of those, I submit "Roasted Apples" for CCLP consideration. The others I'm not submitting, as they're either too simple, obviously incomplete, or too similar to levels in the actual set. Hello, Bit Busters! I've been working on some CC2 levels for a while, and decided I'd show off what I've assembled so far (20 levels) to see what people think. Several of these levels are based around exploring concepts with specific new design elements. This will be the start of my first main CC2 custom level set, which will probably end up containing at least 50, and hopefully 100, total levels. Some of these levels are brand-new, never-before-seen designs, and others are submissions for CC2 level design contests or ports of submissions for CC1 level design contests that I never put in any of my other sets. The levels are sequenced in the order I built them, not by difficulty. All of these levels are to be considered submitted for any and all CC2 community level packs we make in the future. Please let me know what you think of the levels, which ones are easiest/hardest, and if you discover any busts or problems. Happy Chipping! EDIT: Jeffrey already found a bust in Casino Royale, so I'll work on fixing that and upload a new version, possibly tomorrow. EDIT 2: Updated! Now at Version 0.201. I added a 21st level to the preview, named "Pushing the Boundaries". The new version is in the download linked in the first post. Secret exits that skip ahead a number of levels could be a substitute for secret hints, since there's no password system. I like it! We'd just need to come up with a way for the staff to know that one of the exits in a level is intended to be a secret exit...or the staff could add them where they feel they're appropriate, like for some of the secret hints in CCLP4. NOTE: I don't know all the details about how secret/warp exits actually work...in any case, if we include one, we might want to place a hint next to it explaining that the player has found a secret exit so they aren't surprised when it does something unusual. It's not too hard to make and the CC2 main game did it, so sure, why not? Probably for some of the more complicated elements. Unnecessary if we go with secret exits. And passwords don't exist anyway, so any "cypher" we could try to include would have to be less about unlocking a future level and more about a hint towards solving a future level, I think. I just updated the download to fix a few problems that some Chipsters discovered upon release... The hint in Feeling Green? said that blocks remove slime, which is true for dirt and ice blocks, but not "glass" (directional) blocks, which fall into it. I reworded the hint to account for that exception. CC2 Teeth monsters are a bit dumber than their CC1 brethren, and it is possible to slip past them horizontally in 2x2 areas. A few areas in Chateau Crunch have been constrained so you can't skip steps this way. Also, I messed up with the gray button and it was flipping the force floor southwest of it, which I didn't want, so now it's a pink button wired to the floors it's supposed to flip. It should no longer be possible to cheat the house and empty the slot machines in Casino Royale by throwing 2 bowling balls in such a way that the 2 buttons are pressed at the same time, resulting in 3 force floor switches. Thank you, Jeffrey and Ryan, for bringing up these issues and helping me fix them! A few more comments from the levels I just played... Level 18 (Cold Hard Chip): I liked the aesthetic of the hallways with ice tiles down the middle/a few branching off. The yellow key section was just intuitive enough for me to get it on the first try by process-of-elimination even though not everything was visible at the start, which felt good. Unfortunately I didn't realize that you absolutely have to enter the ice checkerboard section from the bottom-right, resulting in a surprise ambush by hidden walls: Level 19 (Drops of Jupiter): This started off nice and relaxing with some simple sokobans with small twists, and then suddenly some harrowing monster dodging near the end...a bit nerve-wracking, but I got through it in one piece. My favorite sokobans were the ones that involved the teleports. Level 20 (Fortune Ravine): Like the previous level, another nice themed campaign level, but here the theme was recessed walls. I think the difficulty was just right here for its place in the set and it very gradually sloped downwards (unlike the previous level which seemed to spike upwards around halfway through). There were a few places I wish I could have seen farther, but also could have probably avoided cooks if I'd been more careful. (The red/yellow/green key section looked like guesswork at first, but then I realized I could tell that the red key had to come before the yellow.) My favorite part was going through a bomb/recessed wall maze and then clearing out the bombs using a fireball cloner! --- And now because it was getting late and I decided to skip around arbitrarily: Level 49 (Seven by Seven): One cool thing about this level was being able to see the whole thing, notice that there is no visible exit--and yet still I knew exactly where the exit had to be. (And I was right.) It turned out much simpler than I expected; I never had to use the trapped ball or the flippers for anything. Was that intended? Anyway, the nice thing about leaving the flippers untouched is that you avoid the "dumb Lynx ending" you mentioned in your designer comment (the tank doesn't need to be stopped on the button if the flippers are still there). Level 31 "Creepy Crawly" A level I made primarily for the "whaaaaaaaaat?" factor. It looks ridiculous at first glance, and then you realize the monsters are circling invisible walls and it's just a small maze. Even if I'd wanted to make it much bigger, I couldn't have, since you can only have 127 moving monsters in a level in MS mode, and the level currently contains 112. Level 32 "Goin' For a Walk" This is basically the obligatory walker level of the set, made at JB's request late in the set's production because I didn't have (m)any walkers levels yet. (I can't recall if I made this before or after Level 73.) That's about all there is to it. I definitely like the other walker level in the set more. Level 33 "Corresponding" A puzzle where, as the hint says, you have to figure out which block corresponds with each water space, and there's only one correct set of pairings. I think it turned out decently but wish it were a little harder. (For a few of the blocks, it's very obvious that they can only go in a particular place, which significantly narrows down the rest.) Level 34 "Pursued By Shadows" There are plenty of monster-dodging levels where you can lure the monsters to their deaths, but not so many where you can send them away only temporarily...hence, this level! All the teleports in the play area are only enterable from the left or top to ensure that no Teeth will unexpectedly pop out of them at you, and the two Teeth trapped in the top-left corner of the level ensure that you can't use the teleports yourself to escape. This is one of my favorite levels from this decade. In an old version (released in the 33-level preview) I had an opening at (11, 13) instead of (10, 14), which caused Teeth to repeatedly move left along row 12 and drop into the spiral, meaning you'd have to lure them alllllll the way around again and again until the coast was clear. Ugh. I'm so glad I changed that for the 63-level preview and the final version. As far as the title goes, JB insisted that I use proper titling conventions and make the "By" lowercase, but I thought the title would stand out more if the "By" was capital, so I overruled him. I'm not sure where I originally heard the phrase, or if I just made it up. It is a book title and a card in a collectible card game, but I hadn't heard of either of them until I did a Google search just a few minutes ago. Level 35 "The Incredibly Safe Maze" Another really silly "whaaaaaaaat?" level, and another way to use invisible walls without a ton of guesswork. There are monsters, but the maze is safe, so they must be held back by invisible walls...hence you can watch them to find your way through the maze! The name might have been inspired by the (very friendly and safe) "Incredibly Deadly Viper" from Book 2 of A Series of Unfortunate Events. Hmm, maybe I should have called this "The Incredibly Deadly Maze". Level 36 "Infernal Cell" A throwback to the four "Cell" levels from Po100T, but instead of force floors between each cell, the monster flows act as 1-way passages within some of the cells. The gliders and water in the top-right are just there to give the level a bit of visual variety. The center of the level could be though of as one big cell, but if you treat the socket and exit as walls, it's 4 cells arranged in a 2x2 pattern, which gives the level 36 cells as its level number would suggest. Level 37 "Tanks, Toggles, Traps" This was one of the very last levels I designed for this set, kind of as a hole-filler. The puzzles were designed mostly by playing with different configurations of tanks and toggle walls and seeing how they could be manipulated, and I'm pretty pleased with how the first couple turned out. However, I couldn't think of too many ways to make them more complicated, so I called it quits after a very easy 3rd puzzle and a 4th puzzle that's very similar to the first 2. The wall pattern has an interesting aesthetic, where I intentionally made the outer walls a mostly continuous path with no squares, crosses, or diagonal-only connections, and only a single "T"-shape. Also, unlike most levels, the title took me a little while to decide after I'd finished building it; in the end I went with simple alliteration. Level 38 "Patterns" "Frogger 2: Swampy's Revenge" inspired me to make this dodging-themed level, as that game had plenty of neat-looking patterns of enemies to dodge--stuff a bit more intricate than "back and forth in a straight line" or "around and around in a rectangle". For instance, in the video below, look at the section with the oncoming enemies after the slide down the curvy vine, and compare that to the fireball-cloning section in the top-left of Patterns. It's a little different (3 paths vs 2) but both sections have zigzagging oncoming monsters to dodge. Anyway, that was one of the concepts I started with...the other was the idea for the bug-and-paramecia section in the bottom-center which I didn't actually know was solvable until I built and tried it. ("Wretched Hive of Scum and Villainy" from CCLP4 has a similar looking section, which may be coincidence, since I didn't play it before designing this level.) I knew some rooms would be harder than others, with the bottom-left and bottom-center probably being the hardest, which is why I let you visit the rooms in any order and skip up to 12 chips (just enough to skip those two rooms, or certain other combinations of rooms). It's possible the level is harder than I intended, even with the ability to skip chips. "Patterns" may not be all that popular, but it's one of my personal favorite levels from the set. I ended up liking the northeast enough to build Level 44, which is fully dedicated to the concept of avoiding monster "snakes" in mazes. Level 39 "Block Unpuzzle" (CCLP4 Level 62) First of all, let me say that I'm super happily surprised by how popular this level is! It was my highest-voted level in CCLP4. Anyway, my first idea was a reverse sokoban where all the trap buttons are initially held down and you need to UNcover all of them. But then I thought it would be more interesting if you had to do both parts--the covering and then the uncovering. The placement of the blocks and buttons was pretty much arbitrary. All I did was make sure there were no 2x2 squares of blocks (for obvious reasons) and no 2x2 squares of buttons (since then you'd be unable to move those blocks for Phase 2) and that I didn't surround all 8 squares next to the center thieves with the same type of tile (block or button). I ended up with this setup, tested it, and found it to be possible and moderately challenging, so I kept it. It was a little bit trickier to design the mechanism that would enforce the two phases of the puzzles. I was working on something involving a column of traps, a column of bombs, and spamming cloned fireballs horizontally after the first phase, but then realized that constantly-flipping-tanks and traps would be a simpler, more elegant solution. Level 40 "Pneumatic Diversity Vents" (CCLP4 Level 63) This level is based on the concept of force-floor-and-ice slides that take you from one section to another. It's named and inspired by a feature in Portal 2 shown in the video below. (It was originally intended to show up in test chambers, but in the final game only appears once, as a means of travel about midway through the game.) I like the block puzzle at the beginning, because it's the first instance I can think of where you have to get 2 blocks out of your way by "storing" them in a single space (fill in water, then pack down the dirt and put another block on that space). I think this is the best-placed of the secret hints. It plays off the CCLP3 trope of "don't pick up any items right away because you might need them to deflect monsters". I definitely didn't want to have this level be cooked if you picked up those chips because that would be pretty mean when the previous levels in this set don't require you to be so paranoid about taking items. However, the fact that you don't have to be paranoid to solve the level, but do in order to get the secret hint, makes the secret hint a lot less obvious than if you had to be paranoid to do both! Plus, once you do figure out the secret hint, it's nice that you don't have to redo the whole level...just enough to reach it. Level 21 "TNT" Just an idea I had for a block-extracting level themed around using explosives (and drills...or something...whatever the keys represent...) to break apart a giant boulder. I meant for there to be just enough blocks, but it turned out that you could save an extra one if you were really careful near the start, which is fine by me since it doesn't change too much. Also, I just couldn't resist hiding the exit under a block with the theme of the level being what it was. The level was originally named "Dynamite" (after both the concept and the Taio Cruz song) in the 33-level preview I released, but then another level by that name got into CCLP1 so at JB's suggestion, I renamed this before the final release to avoid confusion. Level 22 "Stress Reliever" This is a really silly level...just an excuse to murder a bunch of walkers and blobs. The title can be thought of as a double meaning, in that you're relieving stress on your part by getting rid of those troublesome monsters, and relieving the stress on the walls of the packed-to-the-brim rooms containing those monsters. The chaotic ending is there to at least add some challenge...you might want to use the blocks to prepare an exit path for the monsters before you start freeing them. Level 23 "Invisible Plumbing" This is, in my opinion, a pretty neat idea for a blue wall maze--you have environmental clues that tell you where you can walk, rather than having to oof on every wall. In this case, you can see where each path turns and ends, as though you could see the joints and caps on a twisted nest of pipes but not the pipes themselves. (I may have been thinking about the game "Pipe Dream" from the Windows Entertainment Pack as I built this.) I kept the time limit low so that you would most likely have to use the visual clues to finish the level, rather than just pushing blindly on everything. Level 24 "Cross-Hatching" The idea was to use crossing monster paths to create a sort of maze, including paths that you can only travel through in one direction and some squares that you cannot travel through at all (as they are occupied every 2 moves). The name comes from the back of a box of colored pencils, where it was shown as the name of a coloring technique: Level 25 "Freeway" A very short dodging level inspired and named by a game called "Freeway" for the Atari 2600, which I have on a 30-game compilation disc for the PlayStation 1. In that game, you have a limited amount of time to guide a chicken across a 10-lane freeway as many times as possible to score points. So basically it's Frogger except that the river is replaced with more road. I deliberately kept it simple and only focused on dodging, unlike my Frogger-inspired "Froggy!" from Pit of 100 Tiles. I made this before the level named "Frogger" by Wes Powers got into CCLP1, so the similarity with that level is entirely coincidental! Level 26 "Plinko" This is named after the Price is Right game where contestants drop disks into a board with several layers of dividers on the way down, each of which deflects the disk left or right, until it lands in the bottom and they win a prize depending on where. So for this level, you need to guide some Teeth down a series of passages, making them turn left or right to fall onto trap buttons. It's not all that difficult, and the only mildly clever bit is getting the far-left or far-right traps open, where you need to either put yourself in harm's way on the trap button OR stand in the trap while luring the Teeth to release that trap. Originally this was going to be later in the set, and the time limit was low to make it a mild time-crunch level, but I moved it earlier in the released version (and bumped up the time limit in a later update). I realized after making this level that, unlike the game of Plinko, this level isn't very random, so I decided to make another Plinko-themed level, which became Level 73. Level 27 "Serpentslayer" This was probably inspired by the ending of "Mud and Water" from CCLP3, where you have to use a Teeth to disrupt circling bugs and reach the exit. Here I just put that aspect of the level a little more into focus; you have to collect all the chips in order to recruit the "serpentslayer" (a Teeth) to disrupt the "snake" of paramecia guarding the green keys and the exit. 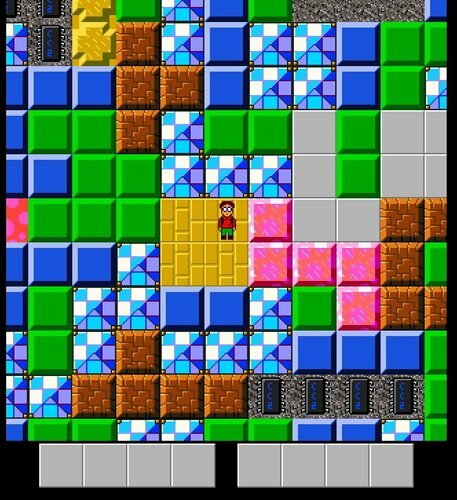 The random force floors and ice corners inside the exit square were just supposed to look pretty, like a treasure horde of emeralds and a big diamond or something...not sure if that really came across. Oh, and the blue wall maze in the bottom is a mirror image of the passages to the right of it...wonder how many people caught that! Level 28 "Build-a-Bridge Workshop 2.0" One of my goals while making this set was to revisit older concepts in a more advanced way...and one way to do that was to tighten up forgiving causal levels into actual puzzles with much less room for error. Even though the original "Build-a-Bridge Workshop" had a lot of blocks and was very open-ended, the concept lent itself well to making a strict puzzle with just enough blocks to complete. Admittedly, this is a strange sequel because the aesthetics are so different (grid vs mess), but the core concept of using blocks and flippers to build bridges, so that you can pick up all the chips after losing the flippers, is still there. Level 29 "Hit the Brakes!!" It's extremely rare to have to slow down on force floors, so I made a level about it. Of course, you can't stay in place while holding backwards on a force floor in Lynx on a straightaway, so I put a bend at the end of every path. Unfortunately that may have made the timing trickier to visually gauge. This level is short both because it's a pseudo "action level" and there were only so many ways I could think of at the time to use the concept. The title comes from a scene in Star Fox 64 where you switch a train onto the wrong track, careening into a factory and causing a glorious explosion: Level 30 "One-Push Sokobans" This is a concept I decided to try to build on a whim as a nod to "One Block Sokoban" from CCLP2. The concept is just as it sounds--each puzzle is solved by pushing a single block a single time. It's definitely not a difficult level (with a concept like this, it hardly could be), but I tried to make the rooms distinct and unusual enough to make for an interesting experience, and I think it turned out pretty well! I deliberately set up the northwest ice checkerboard so that you can look around and see which way to push the block before making a decision. The concept in the southeast room might remind you of "Excuse Me", but I actually made this level before "Excuse Me"! (This was one of my first 33, while Excuse Me was created somewhere in the 34th-63rd range.) So that's it for the 20s! In my opinion this decade has a couple nice concepts but is a bit of a lull in the set, with the decades before and after being more interesting. Maybe that was referring to CCLP2 where buried walls act like recessed walls that aren't visible as recessed walls until you step on them? Level 11 "Bodyguards" (CCLP4 Level 22?!?!) The idea was to make a level where thieves are helpful sometimes and harmful other times. That's about it. I guess some of the monsters are kind of interesting to dodge, like maybe the bugs near the top-left, since this somehow got into CCLP4. And it's not like we were reaching deep down to fill a slot--this was just a few places outside of the Top 149 in voting! It's an OK level, but it's messy and all over the place and I didn't really do much planning while designing this and I think I had much better levels that could've gotten in instead. Level 12 "Halving" I had a few ideas for a maze whose walls change scale as you travel through it, and this is one I ended up building. The first part is a little bit inspired by a custom level called "Two by Two" which is like Chip's Challenge meets World 4 (Giant Land) from Super Mario Bros. 3. It's most evident with the squares of 4 chips. Level 13 "Journey to the Center of the Earth" One level I made way back in Levelset 1.ccl was called "Perish Twice" (name taken from a book I saw in my parents' room, which had a poem by Robert Frost on the back about fire and ice). The level had...fire and ice. Specifically, you had to avoid sliding into the fire, but you could see it ahead of time. Then, eventually, you'd get fire boots and not have to worry about it. Anyway, I made an ice maze with a similar concept here, but used water instead of fire. It's fairly simple to avoid dying; on a floor tile, you can always see the ends of all of its paths that lead to water, and any paths whose ends you can't see lead to safe ground. There's only one exception to that rule, which is the floor at (23, 17) having an up path that leads to water at (28, 18), but there the level layout ensures you will see the deadly path before you get to the floor tile it originates from. (Hence the wording of the hint.) I'm pretty pleased with how the ice maze portion turned out. The rest (some thicker water to represent ocean, dirt to represent crust, fire to represent the mantle/outer core, and gravel/chips to represent the inner core of the Earth) was added at the last minute to take up the remaining space and give it a more unique aesthetic. All that led to a title that makes the level sound much more epic than it really is. Level 14 "Cross Back" (CCLP4 Level 15!) I came up with third room first--a block puzzle that must be solved in two directions and requires you to set up the second trip during your first. (I remember that the idea came to me when I was waiting for my college piano class to start, for some reason--no idea why.) Then I built the rest of the level around that concept of crossing back through rooms. I'm happy with how the first room turned out; there are two distinct solutions, one of which leaves a recessed wall unused. The middle room turned out a little simpler than I'd hoped...it's inspired by a section of Jeffrey's level "Guiding Light" where you have to clone lines of tanks (that cannot be reversed) to direct a fireball. The title is a small callback to Cross Over from Po100T. Level 15 "Elemental Park" (CCLP1 Level 128!) There have been plenty of elemental-themed mazes, but not a lot of 4-part overlapping mazes, so I built one. I definitely like how I was able to make the path of each element mostly contiguous, which sets it apart from something like Triple Maze, while still creating an interesting maze. Fun fact: The original version of this level, which I released in my 13-level preview set for CCLP1 consideration, had some chips on the edges of the level, so J.B. edited the level for CCLP1 to move the chips inward and prevent the player from touching the border. The change was so smooth that I didn't notice until he pointed it out later...so I decided to include the CCLP1 version in the final version of To100T. Level 16 "Parallel Problems" A very simple level that I originally built in Levelset 1.ccl, long long ago. The concept is the exact same; only some minor details like the frequency of the fireball cloning and the number of columns changed, and those only because I lost the original level. Level 17 "Excuse Me" (CCLP4 Level 64!) 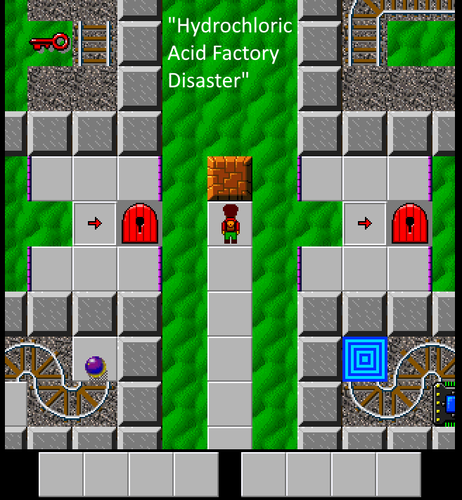 This level was inspired by two things: 1) the section in Think Tank where you have to use blocks to force intermittently-flipping tanks down onto brown buttons; and 2) the section in Choose Your Own Adventure from Po100T where you have to use a block to force an intermittently-flipping tank into a bomb. I thought, what if I made a whole level about that, and made the tank flipping constant to make the theme stand out more? It turned out pretty well, as it got into CCLP4. I'm not sure how fair the lower-right section is with the block-pushing based on what you can see, but at least I gave you an extra block. There is a room you can access once you get all the chips that consists of a small maze of flipping tanks, but there's nothing essential to get there. I just included it as an alternate way from the trap room to the exit room. Level 18 "The Road Not Taken" The level title and concept are based on a poem by Robert Frost. In 5th grade, we had to read and write about poetry, including some by Frost, and his name and some of his poems have always stuck in my head. (My most vivid memory of that class is the teacher praising me for what I'd written about "Stopping by Woods on a Snowy Evening" when it was pretty much just repeating her comments about the poem.) In any case, the poem is about a speaker deciding between taking a well-worn path through the woods or a more grassy, overgrown path that fewer people have taken. Regardless of the poem's metaphorical meaning, the level treats it pretty literally--at each fork you can choose between a monster-dodging challenge with no fake blue walls (the well-worn, popular path) or a blue wall maze (the overgrown, unpopular path). The hint also references the poem (using the phrase "the road less traveled by" and the word "divergence" for "fork"). The dodge required to get past the gliders (where you have to sidestep just as the glider makes a turn below you) is unusual...but not any more strict than dodging a single glider in a 2x2 space. Level 19 "GULP" Another extremely simple level from my Levelset 1.ccl days, basically Hunt condensed. (The old version was also named "GULP"--at that point I randomly capitalized some titles but not others; for example, the Levelset 1 version of Culprit was "CULPRIT".) At least in this version I made the chip path a coherent shape (a spiral) whereas in the original version, the path zigged and zagged all over the place. Not a spectacular level by any means, but I'm happy I had some easy and short ones to spread throughout the set. Level 20 "Salmon" This is the reverse Rat Race, which I'd been looking forward to building ever since I made Rat Race way back in Levelset 1. I just made it much more puzzle-y, since "hide in niches and go against the flow" isn't all that exciting for too long as a pure dodging concept, but there are lots of different ways to create said niches. It would have been Level 23 to match Rat Race, but since I put a secret hint, it had to be a multiple of 10, and 20 was the closest it could be (and also a good place in terms of difficulty). In retrospect, I like the normal ending with the tank puzzle enough that maybe I shouldn't have let you skip it when you find the secret hint...but on the other hand, aren't you glad you don't have to go all the way up the stream again after reading it?